Metal 3D printing is revolutionizing the manufacturing process. Complex shapes, enhanced functional properties and lightweighting are some of the unique benefits delivered by additive manufacturing (AM). While there is plenty of information about printing techniques, materials and hardware, a critical element is rarely mentioned: the need for an integrated software solution for metal additive manufacturing. It takes more than a 3D CAD model and a good printer to get a successful print. Metal AM software handles all preparation and optimization actions that are required for a printed part to meet the desired CAD model specifications. 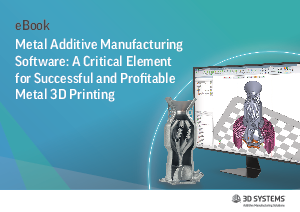 This ebook provides an overview of the preparation and optimization process for AM, explains the importance of software to the profitability of any additive manufacturing business and suggests what to look for when researching AM software solutions.